***If you have any issues with the app or feedback please email us at jason@bit3computing.com, we cannot reply to reviews and cannot resolve issues through the iTunes review system - Thanks*** Taking a vacation to Disney World or dreaming of a vacation? It is always exciting to plan (or dream about) a Disney vacation and to start your countdown. 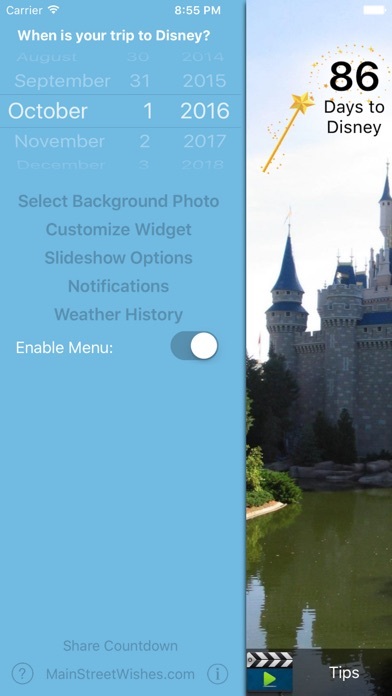 Now you can have the countdown right at the tip of your fingers with 15 fun Disney pictures to choose as your background or select you own pictures, and you have the option to have the pictures play as a slideshow. 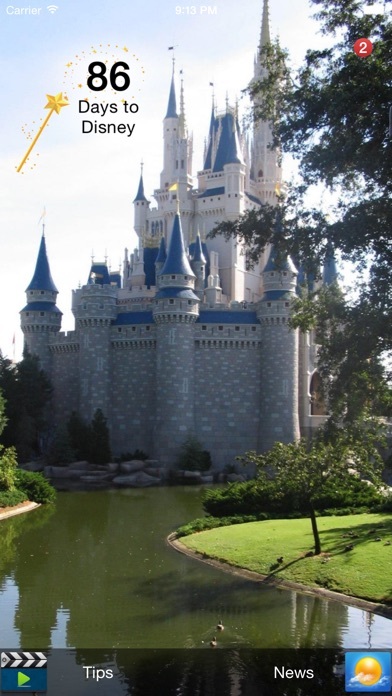 To help with planning and packing you will be able to check the 16 day forecast for Disney World or share your countdown image on popular social sites. 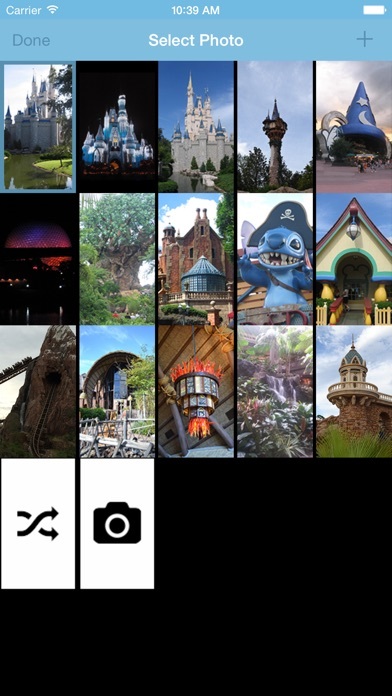 To add to the excitement of counting down to your Disney vacation the full version has extra features that will alert you of important planning notifications, give you tips on many different topics that will help you both before your trip and during, and the ability to crop and size your own pictures as you add them. In addition there is a notification count on the main screen and you will now be able to customize your Countdown widget with the option to change the size, color, and location with the full version of the app. The Countdown for Disney app will keep the excitement going while you countdown the days to your magical vacation to the happiest place on earth! Ad Supported Features: - Countdown to your vacation - Choose from 15 fun Disney pictures or have one randomly selected - Add your own images - Delete images - A 7 day forecast of the weather at Disney World with radar Image map - A 16 day historical forecast of the weather starting from your trip date for the previous year - A slideshow option to display the background images - Select image refresh rate and which images are used in the slideshow - Option to turn off countdown widget during slideshow - Disney News feed from MainStreetWishes.com - Share your countdown image to popular social sites - Today Widget (does not require app to run in background) Full Version Features: - All Ad supported features - No Ad Bar - Customize the size, color, and location of the Countdown Widget - Crop and Size Images when adding to app - Tips for Disney - Planning Notifications - Notification count alert on the main screen - Notifications page shows received and pending notifications - Add Number of Days to Icon Badge (requires opening app at least once every 50 days) - Notifications on the Today Widget - Hide Menu on main screen Notifications: - When most major airlines have scheduled flights - When we recommend you purchase Airline Tickets - When you can start making dining reservations - When you can start selecting your FastPasses - When you can begin online check-in - Time left to customize your MagicBands - As your trip approaches Bit3 Computing and Main Street Wishes are not affiliated with or in any way officially connected with The Walt Disney Company or any of its affiliates or subsidiaries. The opinions (tips) are those of Main Street Wishes and do not represent the Walt Disney World Company and are intended for entertainment purposes only. 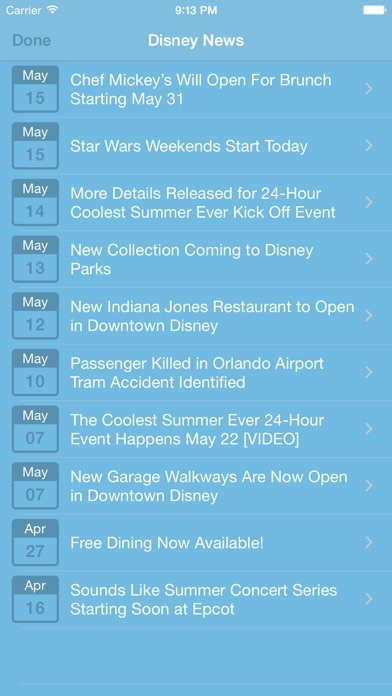 For official Disney information, visit https://disneyworld.disney.go.com/ All Images © 2014-2016 Main Street Wishes Weather information provided by Forecast.IO Interested in a feature not listed here. Email us at jason@bit3computing.com. I’m updating my review since I really like the app and was just frustrated when I upgraded and still had ads. The developer response info worked when I “restored purchase” to give me the ad free upgrade I paid for. Thanks!! I purchased the app thinking that the countdown would show up on my home screen. I’ve had other countdown apps that do. I’m so disappointed. I won’t be using it, rather another app that will just let me use a pic of Disney and be on my home screen. I paid for the full version, but the app still has the annoying ad bar. The only reason I even purchased the paid version was to get rid of the ads and ad bar! Fun App I save a copy every day and make it my locked screen wallpaper. It would be great to do this in an automatic fashion. The other ask is to move the widget on the screen picture. I would like to have the countdown widget in the middle of the page instead of the top. Otherwise a very fun app. I really love this app. I added my own picture for the background. I can change the widget color to match any of my pictures. 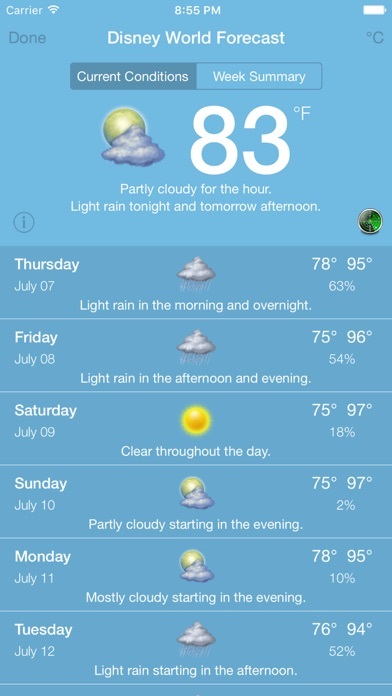 I love that I can see the weather! It will really help for packing! The News section is awesome to be able to see what’s going on during the time we’re there. I bought the full version. It was just 99 cents. Full version is not much different, but again, it’s just 99 cents. I’ve been playing with the app for about an hour on and off and I haven’t figured out how to make it my lock screen or home screen. Most phones have active or live lock screens on them now and I was really hoping this app supported that. I’d love to see the countdown on my phone without opening the app every time. If it has/had this option it would definitely be five stars! Cute app but the radar doesn’t work. I bought the full version to try to fix and it still doesn’t work.